The first first bullet journal I had lasted me from April to July. I suspect that this one, with 192 pages, will probably last me a month or two into next year. 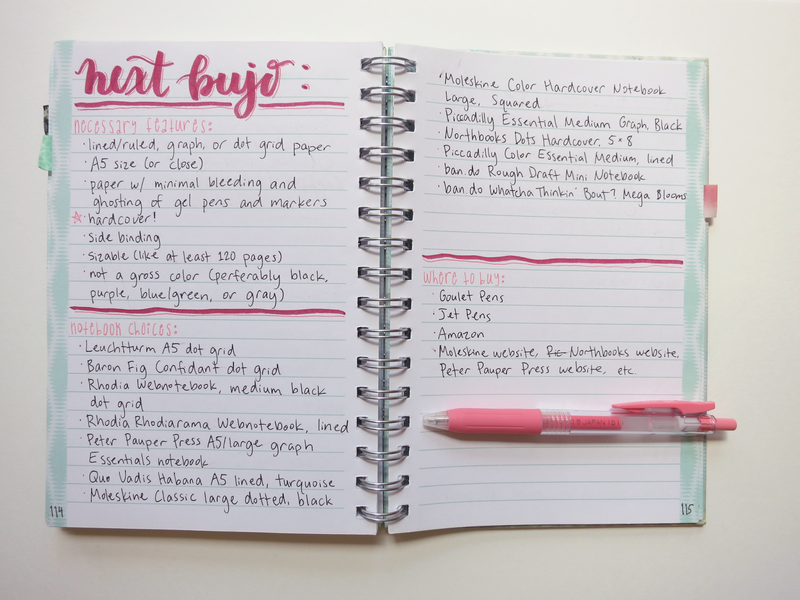 The medium dot grid Rhodia Webnotebook (purchased from Amazon for $17.24) is close to A5 size at 14.0 cm by 21.0 cm, has 5 mm dot grid, and sports beautiful, silky-smooth 90g paper. I was debating between this and the ever-so-popular Leuchtturm A5 dot grid notebook, but I eventually decided on the Rhodia Webbie because of its higher quality paper. 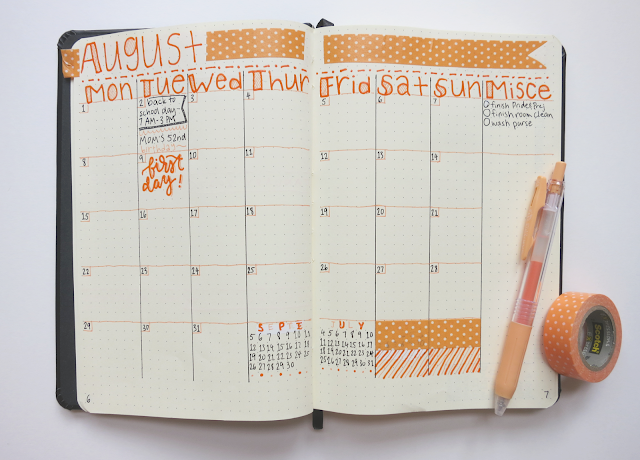 I created this spread in my old bullet journal to help me with the setup of this new one. I went through all of my collections and decided on the ones that I actually wanted to have in volume two. And no, I didn't choose to incorporate every one of my old collections; some of them are not needed anymore, and some of them are just not very useful in general. Admittedly, I have not yet migrated all of the things I plan on inconporating because the notebook only arrived on Sunday, aka the last day of July. However, I will be getting around to it in the near-future - well, let's hope that I do! I put some personal information on the very first page of my new bujo just in case I ever lose it. Originally, I did some brush calligraphy at the very top . . . and I absolutely hated it (of course I mess up the very first thing I do in my new journal). I moaned in agony for a few minutes, and then I taped some scrapbook paper to cover the horrible mistake. 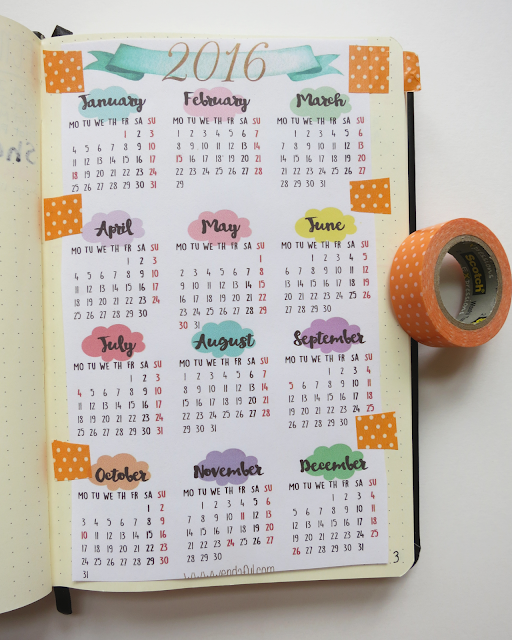 Thankfully, you can only see a hint of the atrocity underneath the washi tape. My key is the same as it's always been. I haven't really changed a thing. I know it's called the index, but the "index" of a bullet journal truthfully is a table of contents and not an index. But yeah, it's self-explanatory; I'm gonna index (table-of-contents?) collections and things like that. Sort of in the same vein the table of contents, I haven't numbered all of the pages yet; because I'm feeling too lazy to do so right now, I will number the pages as I go along. 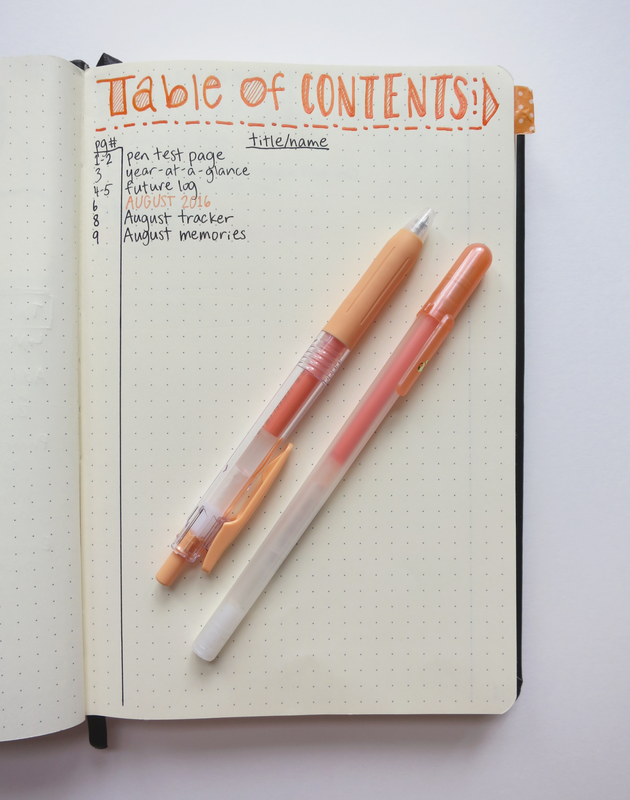 When I set up my first bujo, I was concerned whether two pages would be enough for my index. Fortunately, I used pretty much exactly that amount. Thus, I thought one sheet/one page front and back will be sufficient for this table of contents. Because I didn't feel like looking for another full-year calendar for 2016, I used the same one that I used previously: a free printable from Wendaful. This time, I printed off the A5 version with a Monday start. Wenda is amazing because she included downloads for both Monday and Sunday starts and in a bunch of different sizes - shout out to her! 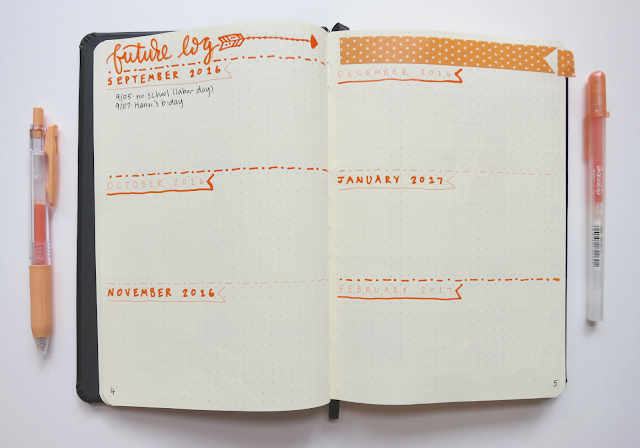 Once again, I used the classic future log; I find that it's easy to setup and simple to use. I still haven't completely filled it out yet, but like I said, I will be getting to that in the near future. 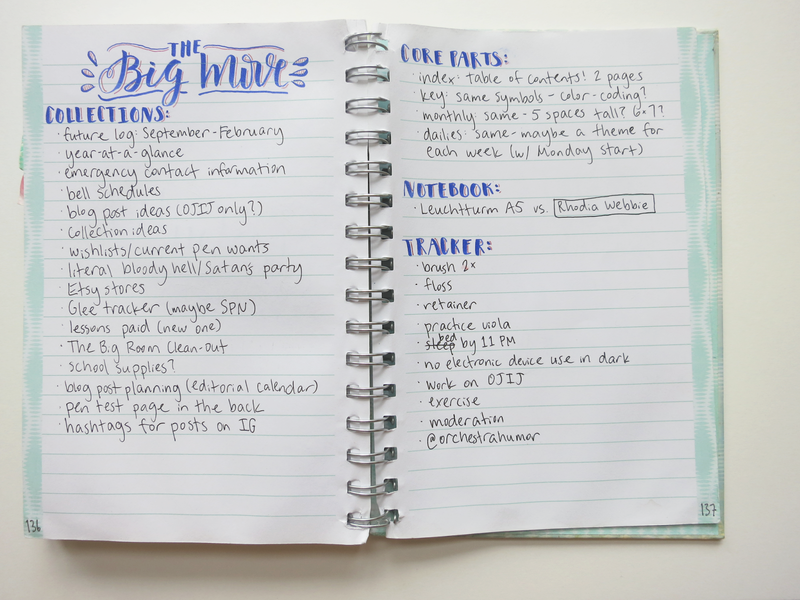 Making this spread was surprisingly difficult because of having to figure out how many spaces each day would get and such. Even after counting the amount of columns correctly, I still messed up the width of the boxes! Good job, me. I used "misce" as an abbreviation for miscellaneous. Here, I put any random notes that don't belong anywhere else or any non-day-specific tasks I want to get done sometime during the month. Also, lots of correction tape was used at the bottom of the spread. Let's not talk about it. 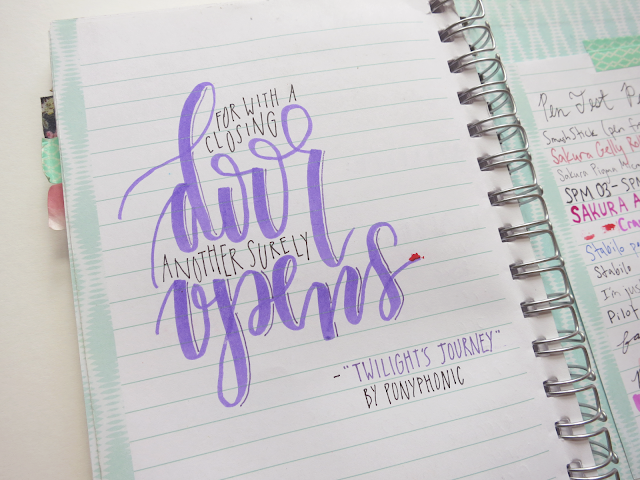 Instead, can we just gush about overall how pretty this spread is? I'm pretty gosh darn proud of it! Additionally, I don't like all of that empty space on the right-hand side, so I think I'll letter something there. 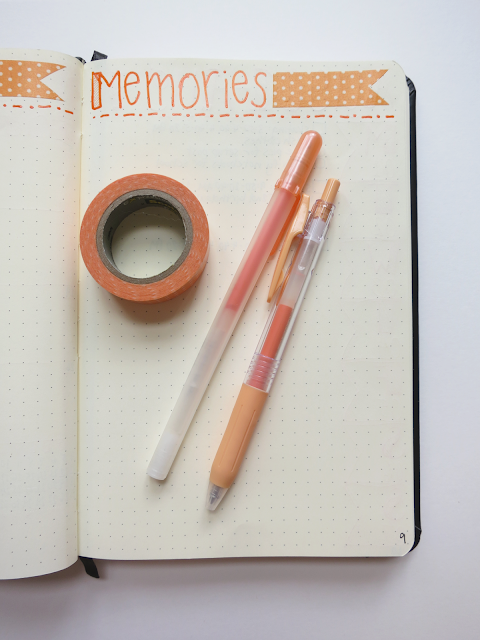 Last month's memories spread is pretty messy, but I still quite like it. If you're wondering what the Chinese in the middle says, it's just the names of the cities I visited/stayed in while I was in China. As I say in pretty much all of my setup posts, I'm excited to see how this page will fill up! 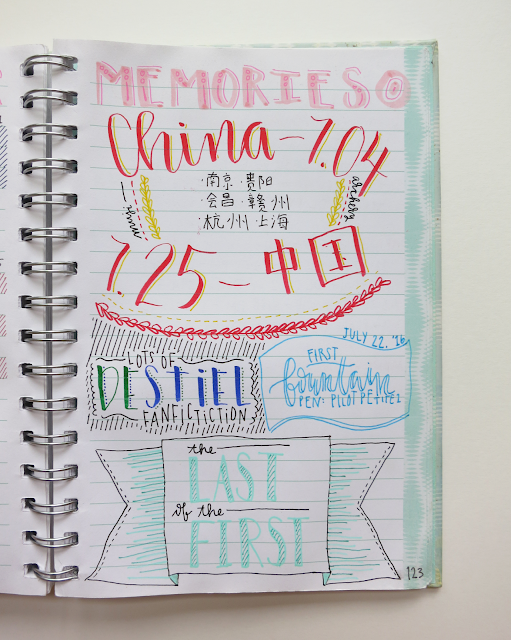 It's always nice to look back at these memory pages and reminisce on the memorable things. This will be my last weekly spread for a very long time; my school starts back up on Tuesday the ninth. 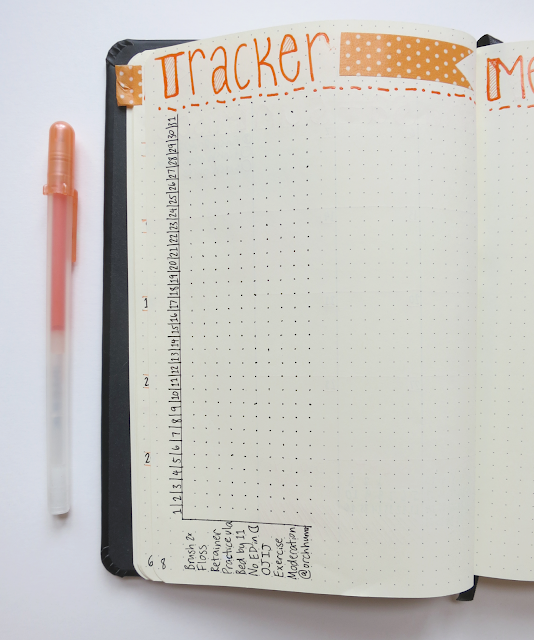 My weekly spreads are always really simple. 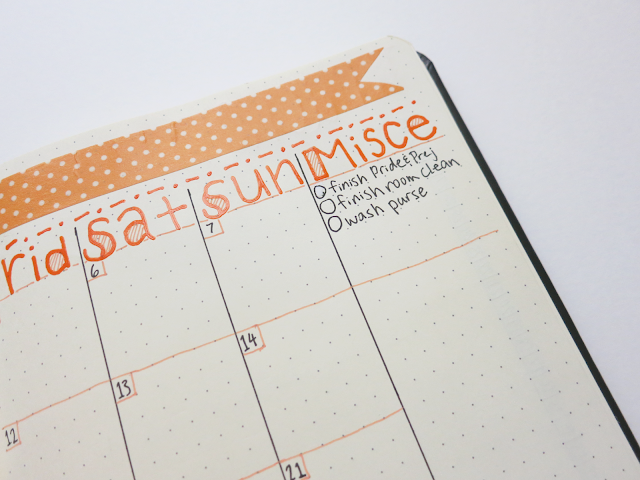 I just make a header with the week's dates and then split up the rest of the page evenly between the seven days. 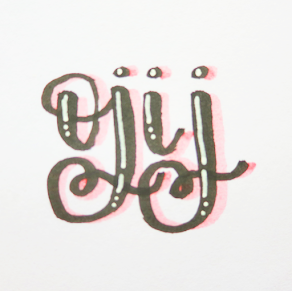 I messed up on this header - I think I accidentally started to write an "e"? - so I was forced to improvise. 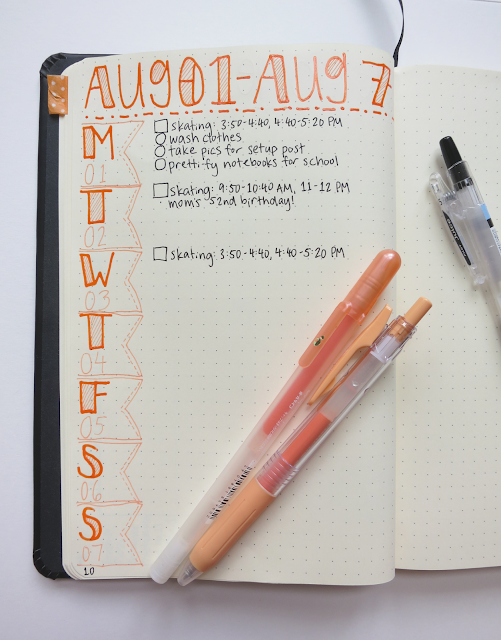 But other than that one weird thing, I'm quite satisfied with this weekly spread. 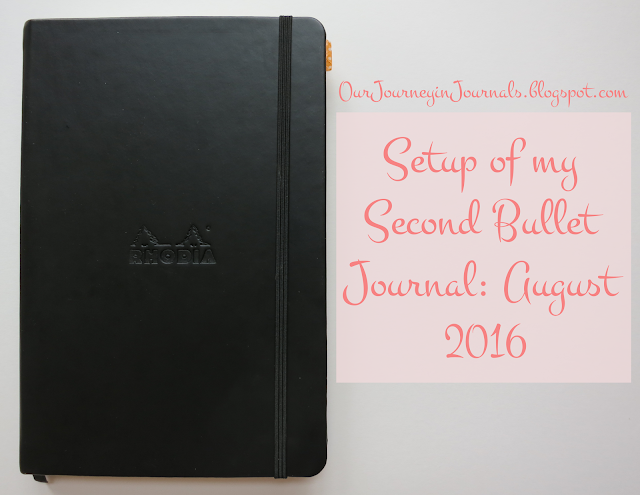 Well, that is it for the setup of my second bullet journal. 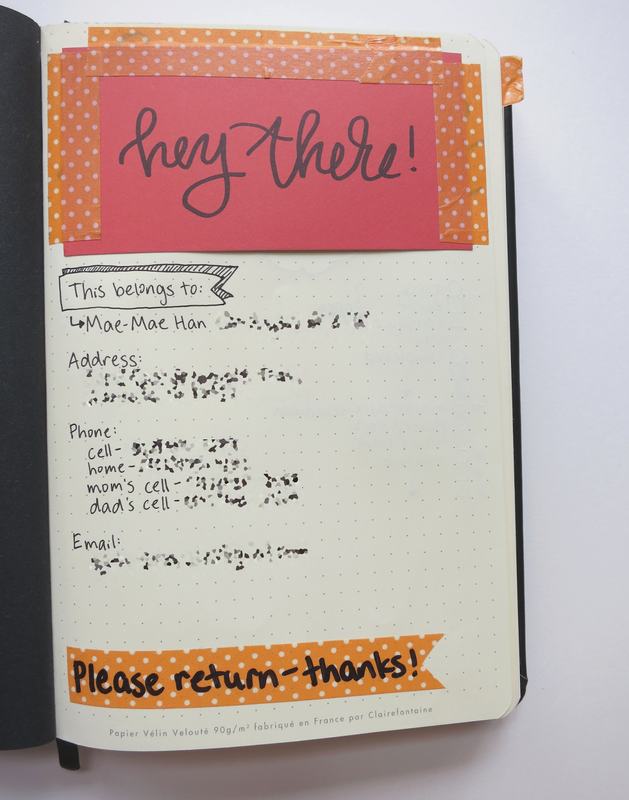 So far, I'm enjoying my Rhodia Webnotebook and its ~wonderful~ paper. I plan on doing a review in the future, hopefully sooner rather than later. I've already started a pen test page (which I didn't picture here), and it's been holding up pretty well to different types of pens. I hope you enjoyed this post! 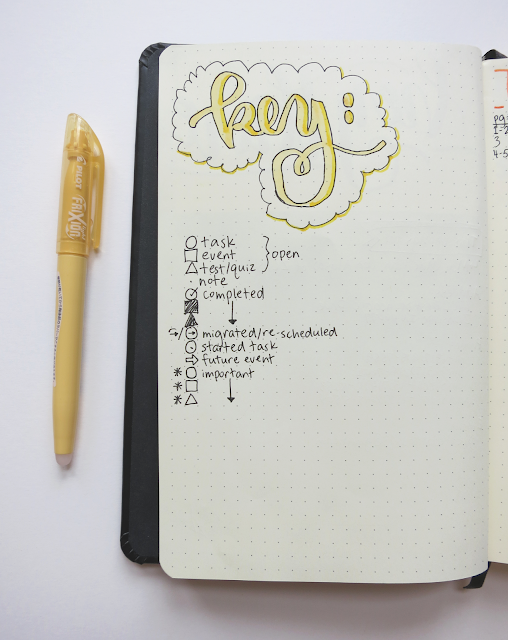 Be prepared for a couple school-related/studyblr posts coming onto this blog soon. 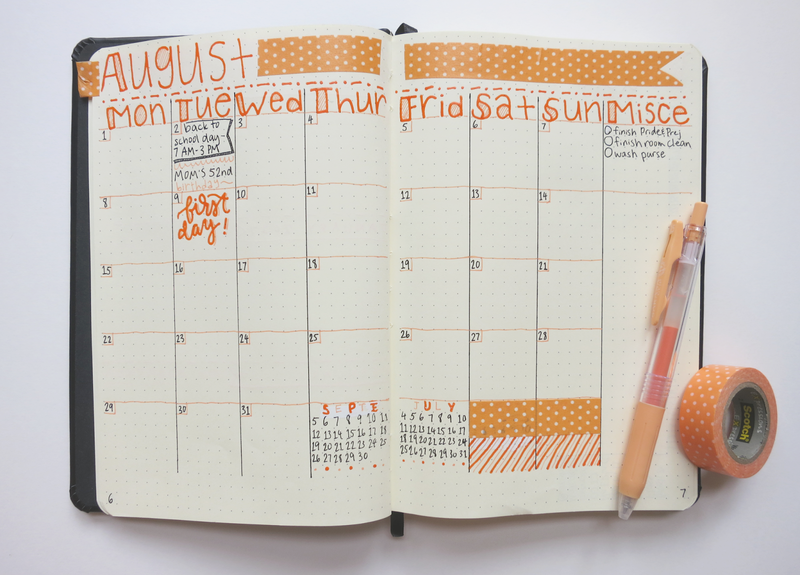 Click here for last month's (July) bujo setup, and click here for next month's (September) setup. What notebook are you currently using as your bujo?